September 16, 2001, a small amount of progress has been made. October 14, 2001, demolition is about halfway complete. December 5, 2001, demolition is nearing completion. News article about the start of demolition, 16-August-2001. The IH-30 elevated structure has loomed over Lancaster Street in downtown Fort Worth for over 40 years. By the end of 2001, it will be gone. 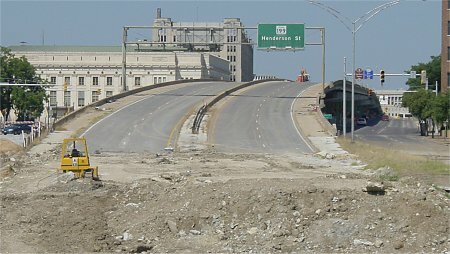 Normally the death of a freeway is a bad thing, but not in this case. The antiquated elevated freeway has been replaced by a modern new freeway a few hundred meters to the south, and downtown Fort Worth will be a much better place without the Lancaster elevated. 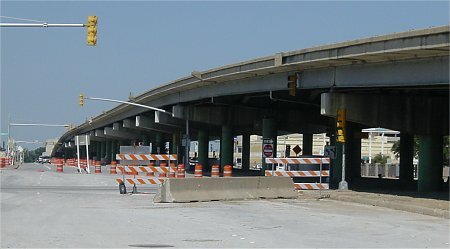 TxDOT originally planned to reconstruct and widen the existing elevated structure on Lancaster Street. 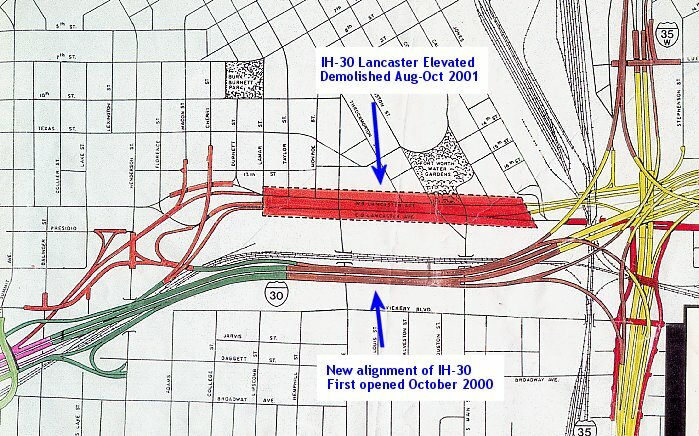 There was strong opposition to this plan, and the public input process resulted in the relocation of the freeway and the new interchange at Interstate 35W. This is definitely a case where freeway opposition ultimately resulted in a much better result for everyone. Of course, the final design probably increased the cost, but it was definitely worth the extra money. Overall, the project will cost around $175 million, not too bad for removing the elevated structure and getting a new freeway. In Boston, Massachusetts, they're paying $14.4 billion to get rid of their elevated freeway. OK, that project is a little bit more complicated (and unfortunately heavily subsidized by US taxpayers), but there's nothing like good Texas value! Map provided by Jason Eargle.